1-1.1 For all decision-making items, formal minutes shall include only a record of decisions taken, including who voted for, against, abstained or stood aside, and a record of all outstanding concerns as provided for in GPLAC Bylaws. 1-1.2 For all non-decision-making reports, formal minutes shall include a succinct written report from the presenters summarizing their presentation. 1-1.3 An audio recording shall be made of every meeting and shall be considered the property of the GPLAC. Its use shall be restricted to an internal GPLAC reference, to settle questions about the minutes or other details about the meeting. No other use is authorized. Providing for audio recordings shall be the responsibility of the Co-Coordinators and the Secretary. 1-1.4 No video taping of any individual present at a meeting is authorized without that person's consent. 1-2.1 For the election of GPLAC officers like Co-Coordinator, Secretary and Treasurer, for GPLAC Delegates to the GPCA General Assembly and GPLAC Standing Delegates to the GPCA Standing General Assembly, and any other such election, the election shall be conducted so as disclose the intentions of the voter. 1-2.2 Where votes are cast votes by written ballot, County Councilmembers shall identify themselves on the ballot. Where votes are cast by email, County Councilmembers shall identify themselves when casting their vote. Where votes are cast on a voting page, the voting page shall be designed so as to record the identity of the voter and a record of their vote. 2-1.1 Nomination Petition signatures for appointment to County Council may be submitted at any time and shall be validated within seven business days of their submission to either of the GPLAC Co-coordinators. A scan may be submitted electronically, as long as a hard copy is provided within 15 days to the Co-coordinators. 2-1.2 The Co-Coordinators and the Secretary shall have the responsibility to ensure that the Green registration status of the petition signers is validated. Validation must occur within seven business days of signatures being handed in to the Co-Coordinators. Validation shall include comparing the signatures to those at the County Registrar's Office. 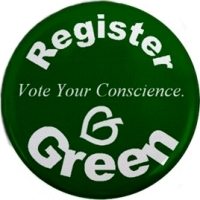 2-1.3 If there is a dispute over the Green registration status of petition signers, such that the required number of valid signatures is not reached, an appeal may be made by the applicant to the County Council and agendized at its next meeting. The Co-coordinators shall make a written report of their findings available for inclusion with the agenda for that item. A 3/5 vote shall be required to overturn the decision of the Co-coordinators. 2-2.1 Any person appointed to the County Council at a face-to-face meeting, can participate in any subsequent County Council decision making, whether in person, or via teleconference, email or voting page, that takes place after that meeting has concluded. 2-2.2 Any person appointed to the County Council by virtue of an on-line vote, can participate in any subsequent County Council decision-making once they attend a face-to-face meeting, except that if no face-to-face meeting is held within 30 days of their appointment, they can participate in any subsequent County Council decision making, whether in person, or via teleconference, email or voting page. To participate in a face-to-face meeting after being appointed on-line, one must be appointed by the deadline for the release of the agenda for that meeting. 3-1.1 The County Council may make decisions on-line via the process described in this Article and as otherwise provided for in GPLAC Bylaws. 3-1.2 Quorum and approval thresholds shall be the same as those defined for County Council decision making in GPLAC Bylaws Section 9-2 Quorum and Section 9-4 Consensus Seeking. 3-1.3(d) For the approval of County Council meeting minutes. 3-1.4 All on-line proposals must by co-sponsored by at least two County Councilmembers at the time of their posting; must be posted in the format specified in 3-4; and must be posted to the County Council email list (gplac-cc@cagreens.org) with the subject header of the email stating "ON-LINE PROPOSAL: subject/title of the proposal", or in the case of proposals with an expedited timelines as per 3-3, "EXPEDITED ON-LINE PROPOSAL: subject/title of the proposal". 3-1.5 All on-line elections for internal party positions must by co-sponsored by at least two County Councilmembers; must be posted in the format specified in 3-5; and must be posted to the County Council email list (gplac-cc@cagreens.org) with the subject header of the email stating "ON-LINE ELECTION: election of which position". 3-2.1(c) Considering and accepting amendments. 3-2.2(d) Responses by candidates to questions and concerns. 3-2.3 All votes shall be cast on the County Council email list (gplac-cc@cagreens.org), except if a County Councilmember has no access to email during the voting period, they may call in their vote to one of the GPLAC Co-coordinators, in which case it is the responsibility of the Co-coordinator to make a good faith effort to post the vote to the County Council email list as soon as possible and no later than the conclusion of the voting period. 3-3.1 Proposals of a time-sensitive nature may be proposed with an expedited discussion period of less than the seven days. Expedited Proposals shall include a 'statements of findings' explaining the need for the compacted discussion schedule. When voting upon an Expedited Proposal, the County Council shall cast two votes: one regarding the statement of findings and the other on the proposal itself. The statement of findings must be approved for the proposal itself to be approved. 3-6.1 It shall be the responsibility of the Secretary to post the results of on-line votes to the County Council email list within 24 hours of the conclusion of any vote and to the GPLAC web page within ten days of any vote. 4-1.1 In order that Green Party members in Los Angeles County be made aware of how to run for county council, a page shall be provided on the GPLAC web site that explains how to run for County Council, and each electoral cycle the County Council shall ensure that it is publicized. 4-1.2 In order that Green Party members be made aware that they can sign the nomination petitions for Green County Council candidates in their district, and to aid potential County Council candidates in connecting to Green Party members in their district, a link shall be provided from the GPLAC web site to the page on the Los Angeles County Registrar's web site that contains contact information on all candidates seeking to qualify for the ballot. 4-1.3 In order to provide information to Green voters about County Council candidates, a web page shall be provided on the GPLAC web site that lists all candidates, and provides links to each candidate's campaign web site - which could be their own web page, or their page on Smart Voter or other such non-partisan voter education services. 4-3.1 Official email communications on behalf of the GPLAC, either by the GPLAC Co-Coordinators or the GPLAC Secretary shall be copied to the others. Official communications by the Treasurer shall be copied to the Co-Coordinators and Secretary. 4-3.2 All such communications shall use the following email addresses in copying communications to each other: gplac-cocos@cagreens.org, gplac-secretary@cagreens.org and gplac-treasurer@cagreens.org. These email addresses shall be attached to a web-archive, which will archive GPLAC official communications. 4-4.1 The Purpose/Charter of the gplac-forum@cagreens.org shall be to provide a place for open discussion by any LA County Green Party member about issues, strategy, trends, organizing and other activities of the Green Party in Los Angeles County. 4-4.2 Read/write participation shall be open to any Green Party member in LA County, with participation subject to the GPLAC eRules. The List Administrator(s) shall check all submission requests against the list of registered Greens in LA County. By signing up one agrees to abide by the Green eRules. Submission requests shall be processed within seven days. At a minimum, Green registration status of participants shall be checked each time the GPLAC obtains a new voter registration list. 4-4.3 GPLAC County Council members (and GPLAC state Coordinating Committee regional representatives) are encouraged to subscribe to this list, either in full or digest form. 4-4.4 Event Announcements should be limited to those related to the activities of the Green Party and/or Green Party members. 4-5.1 The Purpose/Charter of the gplac-cc@careens.org shall be for the business of the County Council, only among County Council members. 4-5.2 Read/write participation shall be open to all County Council members. The List Administrator will automatically place all County Council members on the email list as full participants. In participating, all County Councilmembers agree to abide by the Green eRules. 4-5.3 Read-only status shall be open to any other Green member in LA County, available either through a web archive or as email. County Councilmembers may periodically forward emails from non-County Council members where relevant to the business at hand, but not in order to insert the non-County Council member into the debate in an ongoing manner. 4-5.1 The Purpose/Charter of the County Council Voting Page shall be for conducting and recording votes of the County Council and shall use the same design and format as the Voting Page used by the GPCA for its Standing General Assembly. 4-5.2 All County Council members retain their right to participate and vote as they would under GPCA Bylaws. Results will be available to be read by all, with a link from the GPLAC home page and County Council page. 4-6.1 Participation in GPLAC on-line forums is open to all Green Party members in Los Angeles County. It is based upon the premise that people participant in order build the Green Party and advance the Ten Key Values. 4-6.2 Green eRules are meant to help promote a productive, transparent and respectful environment for this to occur. GPLAC on-line forum participants are encouraged to state their views, inform one another, and discuss issues in depth, in a manner that enables energy to be focused on productive work. Disagreement over issues and ideas should be honored as an expected part this process, and is not to be considered a disruption or impediment. The full text for 'Expectations and Standards' and Restricting Dispuptive and/or Unethical Behavior' is contained in the appendix below. The GPLAC shall forward to Active Green Locals, referrals for those areas of Los Angeles County that those locals are recognized for, that come in through the County, as well as referrals that come in from the Green Party of the California and the Green Party of the United States. The GPLAC shall maintain and improve a data base of registered Green voters in Los Angeles County and may accomplish this by working with the Green Party of California to maintain the Los Angeles County portion of the GPCA's registered Green voter data base. 5-2.1 There shall be a Database Coordinator that is responsible on behalf of the GPLAC for managing the Database according to the direction set by the County Council. 5-2.2 The Database Coordinator shall be responsible for maintaining the database, including cleaning and updating the email addresses, and entering information as needed that comes from web and phone referrals, the GPCA from its fundraising and volunteer records, and from any Green local or candidate that chooses to share it. 5-2.3 The Database Coordinator will provide quarterly reports to the GPLAC. 5-2.4 The Database Coordinator will not provide access to, nor share the contents of the database with any individual or organization, unless specified to do so by the County Council, and the Database Coordinator will sign a document with the County Council to this effect. 5-3.1 There shall be a Database Committee that shall work with the Database Coordinator to help implement County Council direction regarding the Database. The Committee shall include the GPLAC co-coordinators, the Database Coordinator as well as additional members as appointed by the County Council. 5-3.2 The Database Committee shall create options for GPLAC members, so that they could receive by email, the type of information they are interested in. This could include notice of County Council elections as described in 4-1, and for internal offices as described in 4-2. Access to the data base shall be at the discretion of the County Council and in keeping with the GPCA's IT Protocol. Individual County Councilmembers shall have no special access to the data base, other than that provided for in these Rules and Procedures. 5-4.2(a) The harassment of any voter or voter's household. 5-4.2(b) The advertising, solicitation, sale, or marketing of products or services to any voter or voter's household. 5-4.2(e) Anyone with access to the data base, and anyone to whom data base content is exported, shall be governed by these rules, and shall make such a declaration in writing to the County Council. Candidates endorsed by the GPLAC County Council shall have an email announcing their endorsement sent by the GPLAC to all registered Greens in their district for whom the GPLAC has email addresses. Endorsed candidates shall have a minimum of at least one additional email sent on their behalf in both the primary election and the general election (where there are both). The County Council shall retain the option to send to send additional emails at its discretion. The GPLAC will develop and authorize periodic fundraising appeals directly to its members via email and the fundraising link on the county's website. It is the responsibility of the GPLAC co-coordinators to communicate to the GPCA that the GPLAC would like to obtain the donor and volunteers lists for Los Angeles County in the GPCA's possession. Participation in GPLAC on-line forums is open to all Green Party members in Los Angeles County. It is based upon the premise that people participant in order build the Green Party and advance the Ten Key Values. The following expectations and standards help govern participation on GPLAC forums. 1. No anonymity. All subscribers must truthfully identify themselves at the time of subscription, and in the body of each message. At subscription time, applicants must give information sufficient to contact them in the event they lose email access. 2. Address the group. Messages must be addressed to the entire group of subscribers. Side conversations and personal interactions must be taken to one-to-one email. 3. No "personality-based" discussion. Speculation or accusations about another's motives, thought processes, or beliefs is off-charter. A focus on 'issues rather than personalities' should be the participants' guiding light. Personal attacks, verbal threats and/or harassment can be grounds for loss of subscription. 4. No misrepresentation of another's work. Participants shall not misrepresent the work of others and shall make a good faith effort to be factually correct. 5. No prejudicial, biased, or offensive language, with respect to race, gender, ethnicity, physical ability, spirituality, sexuality, or age. These are well-established principles of basic respect for each other in a healthy society. 6. No insulting, disparaging, degrading, or demeaning language or any other ad hominem attacks. It's never necessary to label others in order to discuss their ideas and activities. Chronic, hurtful sarcasm, or giving people vengeful nicknames, or any other disrespectful treatment of fellow activists, is grounds for loss of subscription. It is never necessary to compare people to historical war criminals or other reviled figures. 7. No flooding, repetition or crossposting. No double posting to other lists. A message posted to this list must have no other recipients (except the poster) in its To:, Cc:, or Bcc: lines. 8. No off-charter material. There are thousands of Internet mailing lists about issues of interest to Greens. Nobody can read them all, and each of us must be free to set our own priorities. One can repost a message from elsewhere, but must introduce it by explaining where it came from and what it's got to do with the GPLAC, even if the relevance seems obvious. 9. Accurate, substantial subject lines. The "Subject:" line must truthfully identify the topic, so that people can decide whether to read your message, before they read it. Therefore, It is seldom appropriate to name another person in a Subject line. In particular, messages with Subjects such as "Joe Green" or "Joe Green's post" are not allowed. Messages with no Subject line will be rejected. 10. Respecting subject lines/threads. When a subject line is established and a discussion occurs, that subject line should be respected and not changed. A new subject line is appropriate when the subject has changed, but not as a tool to disrespect the initial poster or postings. 11. Limit message size. When replying to a specific discussion thread, it's not necessary to quote the entire email each time. This helps servers run faster. 12. No 'cracking' (defeating the security of other peoples' computers) or forging someone else's email identity. Messages to the lists must be addressed to the announced posting address. No attempts to defeat the operation of the server software by guessing internal addresses are allowed. Messages to the lists must contain a From: address which is substantially the same as the address where the poster subscribes. False From: lines will be treated as an attempt to breach the physical security of the list server, and may violate your local "computer misuse" or "chattel trespass" laws. 13. Format of messages (25K maximum). The language of Internet email is plain text. Two alphabets are acceptable in these lists: the American Standard Code for Information Interchange (ASCII) and the International Standards Organization's ISO8859-1, also known as Latin 1. (Latin 1 encoding must be correctly specified in your message header, using the Multipurpose Internet Message Extensions. Don't worry, most email software does this automatically.) No graphics, word processor documents, Microsoft Rich Text Format, or other non-text encodings are allowed, with one exception: customary cryptographic signatures or fingerprints are allowed. Keep the message size limited to 25K. 1st infraction) Receive a private warning, wiht a reminder of the rules, from either a GPLAC Co-coordinator, the GPLAC Secretary or the Forum Moderator -- and with an explanation of the subsequent process if other violations occur. Multiple infractions within a 24 hour period will be treated as one infraction. 4th infraction) Be unsubscribed from the Forum, by the Forum moderator. The period of suspension shall not be less than three months and may be up to one year, upon discretion of the Forum moderator. This decision may be appealed to the County Council, with a 2/3 vote necessary to overturn or amend the decision. As part of this process, the suspended member will be given an opportunity to submit a written response. During the period of suspension, the offending member will not be entitled to post any messages to the list, or to circumvent the suspension by submitting messages via another member's email account. Should the County Council decide to reinstate the member's privileges, but with conditions, these shall ordinarily include the member's acknowledgement that he/she has been impeding the listserve work, and agrees to curtail the disruptive behavior, as prerequisites for reinstatement. It may also include participation in mediation. The GPLAC Forums exist to facilitate the work of the GPLAC. Ultimately it is the County Council's responsibility to judge whether a member's behavior on the GPLAC Forums, over time, is overly disruptive. The decisions of the County Council, through its choice of Forum Moderator and through review of his/her decisions, are final.